Mitsubishi Chemical Advanced Materials has developed a new, polyamide passenger airbag housing for use in vehicles based on the Volkswagen Golf platform. The housing, molded from impact-modified polyamide 6 with 40 percent glass-fibre reinforcement, is just under half the weight of the original metal counterpart and provides considerable cost-of-manufacture savings. The part is being installed in vehicles such as the VW Golf, Audi A3, Seat Leon and Skoda Fabia since early 2007. Mitsubishi Chemical Advanced Materials’ ability to integrate its tooling and processing knowledge into the highly-automated production of creatively-designed parts has been appreciated by the customer. 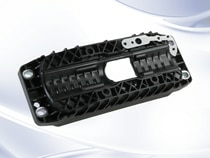 For this particular airbag housing, four metal bushes – used to secure the airbag housing in the dashboard – are molded into the housing. In order to fulfil requirements for the cost-effective and efficient production of a large number of housings per year, a brand-new production line for this application was installed, which included an automatic feeding system for the bushings, as well as robots for their insertion and the release of the moulded parts. The ability to co-develop the housing in a 3D CAD environment, were further Mitsubishi Chemical Advanced Materials contributions to this project.